People seem to be really interested in Iorveth's teeth wherever we go so I thought maybe people here might be too. People get really curious when we talk about raw and want to know how he does with he bones since he is missing so many teeth. He does just fine and is a speed eater who has to have frozen meals. He only has one carnassial in each jaw (so a total of 4) and he knows how to line things up just right when they need a crunch. Coated Xolos have full dentition just like a shepherd or a retriever, but the hairless Xolos are missing teeth. 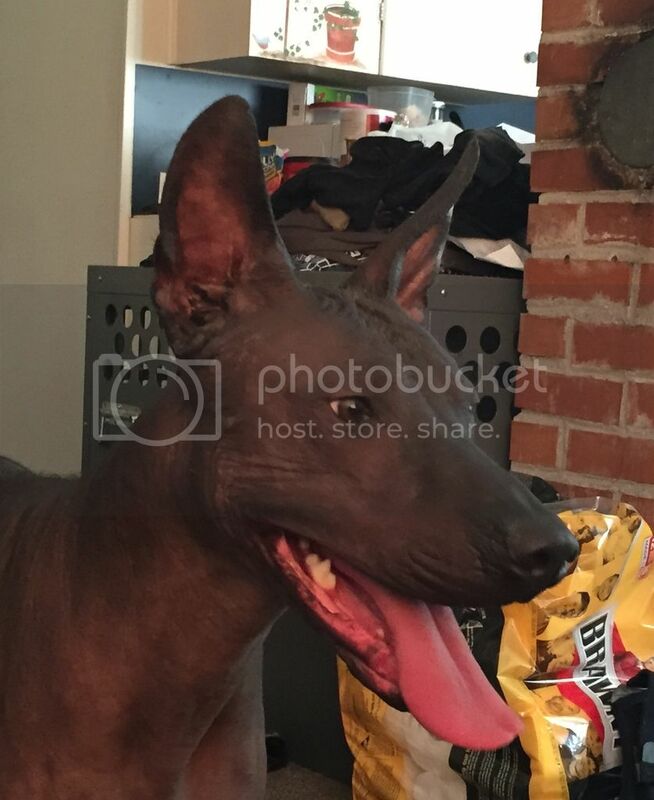 Some think that coated Xolos are essential to the breeding programs in order to put a higher number of teeth in the mouths of the hairless dogs, but I am in the genetic camp. My guy is from a breeding program that does use coateds (which are important to the breed for more than just the teeth reason), but the dogs from his particular line don't have as many teeth as the dogs from the Mexican breeder our next Xolo will come from who does not use coateds. 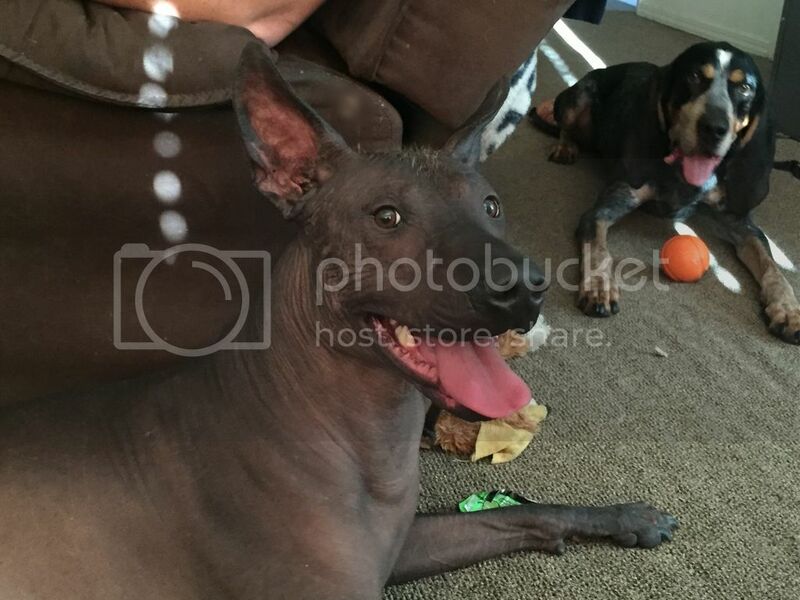 All of his coated puppies are sold to pet homes and he only breeds hairless to hairless but, according to a friend of mine with multiple dogs from that kennel as well as one of Iorveth's paternal half sisters, her Mexican dogs from the Mexican breeder all have around 80% of their teeth. 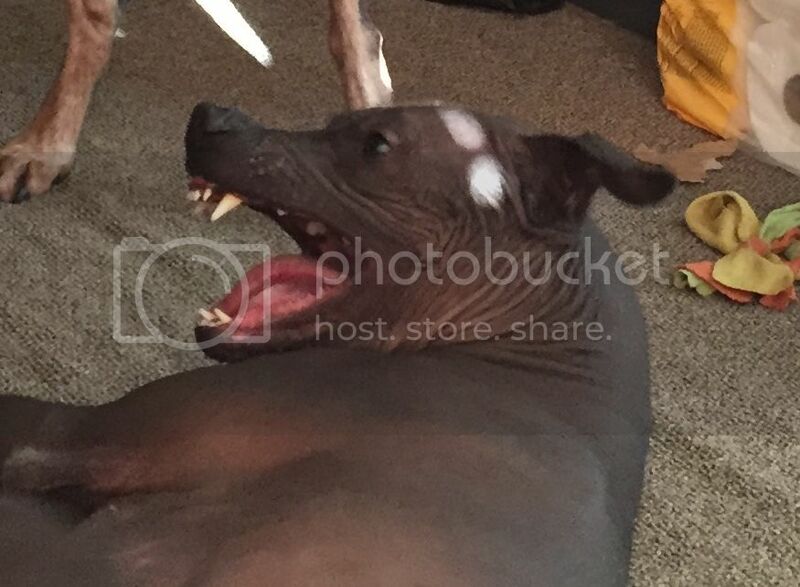 Hairless Xolos have really funky teeth. Their canines jut forward more rather than down and it looks really weird to some people, I guess. Sometimes hairless Xolos have to have dental work done because of bad tooth placement in their mouths, but our vet hasn't found anything to be concerned about in Iorveth's mouth. He could lose some of the teeth he's got and some Xolo owners try to protect the teeth, but I'm in the side that says, "Let them use their teeth and keep the strong teeth strong". 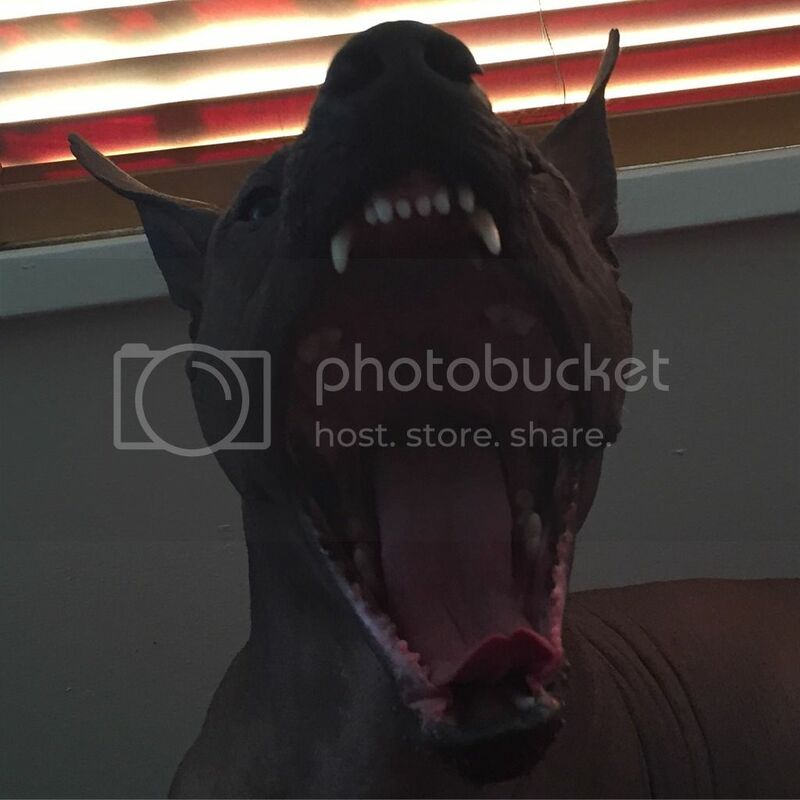 Anyhow, I've been getting pictures of the inside of his mouth lately because he's obnoxious so I thought I'd post them here in case anyone was interested in the dentition of a hairless dog who eats raw just fine. It does look like he's got what he needs in the back to be able to chew bones. If you give Iorveth a small, hard treat like a piece of kibble or something, it's pretty funny because you can see him using his tongue and his lips to line it up on his teeth just right so he can crunch it. Tired dog eh? Is it the pics or do the canines lean more forward than the typical? Gotta love the whites of raw fed dogs. 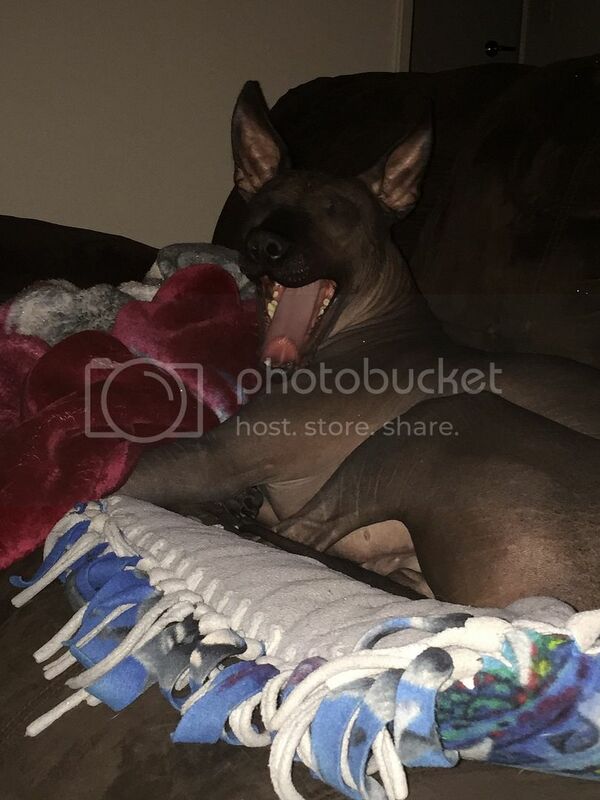 I find it very interesting that the breeder who uses only hairless dogs has a large percentage of teeth present in their dogs. I've always heard the argument that coated dogs are needed to "help" in that area. Thanks for sharing! 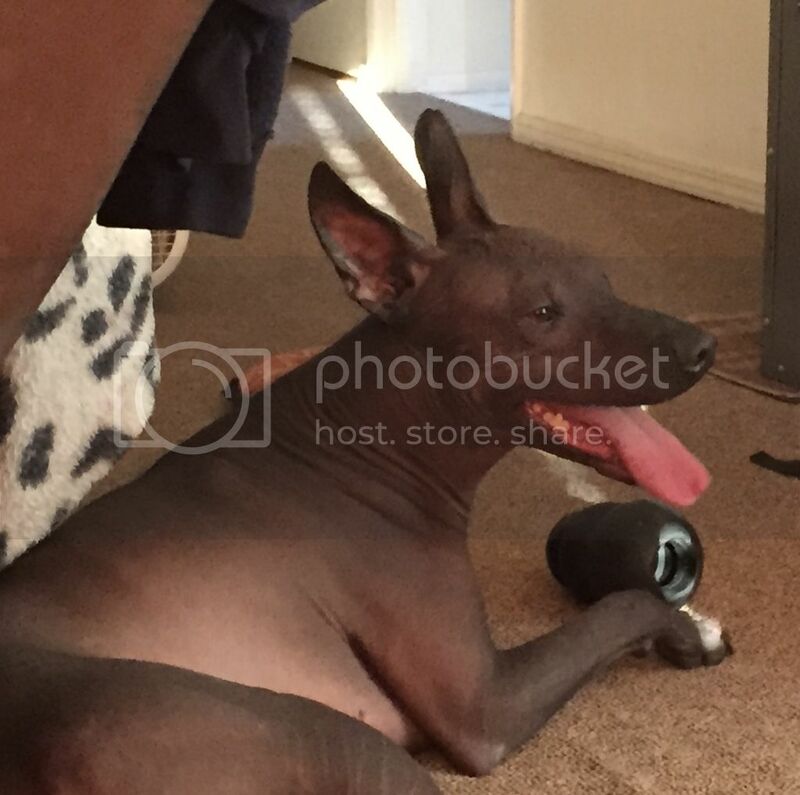 The forward teeth in the front are a trait of the hairless variety of Xolos. Ha! I didn't even realize that the last three were all of him yawning. He normally doesn't show teeth when he yawns like in the first two yawning pics, but I was poking him and we were playing. 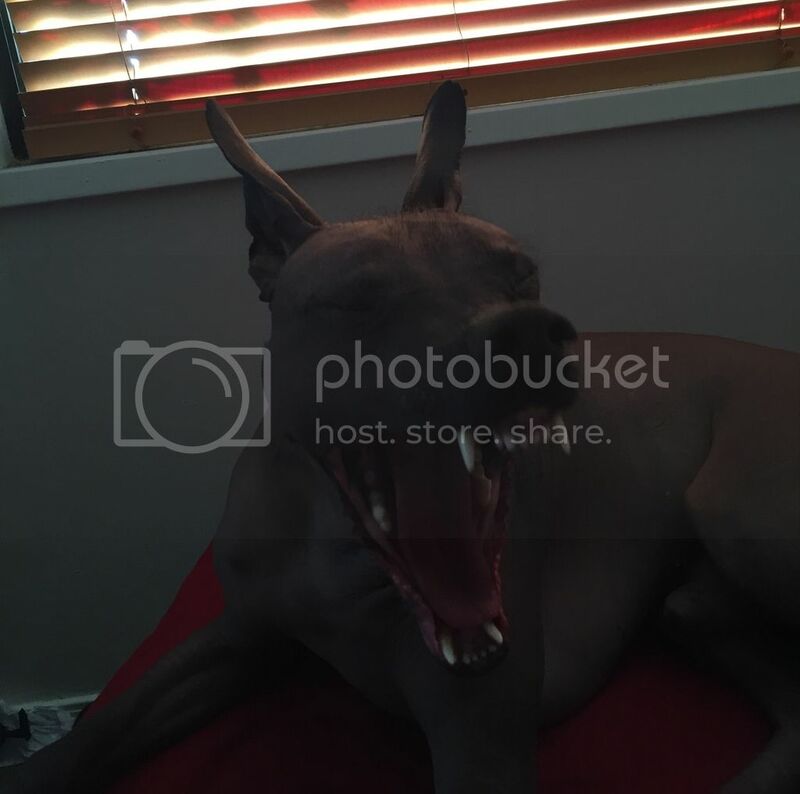 He "smiles" a lot when he's in a goofy mood and, if he yawns when he's acting that way, he holds the smile while he yawns which resulted in those two pictures. The last one was when he'd just woken up from a nap. I've learned to tell when he's going to yawn and, when he wakes up he yawns several times before he's up and ready to go so it's gotten easier to catch photos of it. The third photo down is of his "smile" although he doesn't always have his mouth open. Those first few were taken while he and Buck were playing this summer. It is very interesting. Now, I have never seen this breeder's dogs for myself and probably won't until we get our next Xolo as it's going to be one of his, but a friend of mine has a few and she has seen his dogs for herself so I do trust her word. She has a lot of Xolo experience and is making a name for herself as a breeder of some very nice Xolos. She and I have talked about it and, while I don't think there's been a ton of actual research done into Xolo dentition in relation to coated dogs, it sure does seem that it has more to do with genetics rather than the use of coateds. Personally, I am not against coateds and believe that they have their place in the breed just like any other coat types in other breeds. Coateds are having a very hard time gaining ground because the hairless are preferred, but they definitely have their place. Another friend of mine who has a pack of several Xolos just bought a young adult coated because her hairless guys were limited in their agility seasons due to the cold. She bought this coated guy (an absolutely gorgeous tricolor with some funny roaning) so she could have a dog to run in the winter. Other people like them because they can have all of the Xolo personality and charm without feeling guilty about living somewhere cold. They also help create a larger gene pool. The Mexican breeder is often slammed for his "no coateds" policy and people like to say he culls the coateds. He does cull them, but not the way people so often think when they hear "cull". All of his coateds are altered and sold as pets.